Insulation Tape, Electrical, High-Temperature, Glass Fiber, Pressure-Sensitive with silicone adhesive. 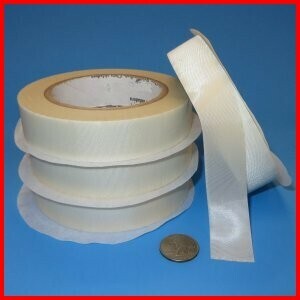 This high temperature tape is heat, flame and fire resistant. Fiberglass (fibreglass or glass-fibre) fine-weave woven tape with silicone adhesive. · 3000 volt dielectric strength. · Tensile strength of 180 lbs/in (314 N/10mm). · Maximum operating temperature is 200°C / 392°F. · UL recognized and meets Mil-I-19166C. · Replacement for RG48 tape. Smooth, excellent adhesion, high temperature use, insulation class "H". This tape is used to provide reinforcing insulation in electrical installations. Used on splices requiring more abrasion resistance and mechanical strength than can be provided by silicone tapes. This tape is often used as an insulation overwrap for bleed air and other high temperature ducting on gas turbine engines. Although the rated temperatures is 392F/200C - it can be successfully used to 500F/260C due to the high temperature capability of the silicone based adhesive. Shelf life is guaranteed for 1-year from issue of Certificate of Compliance. Tape can be inspected and re-certified for additional shelf-life.